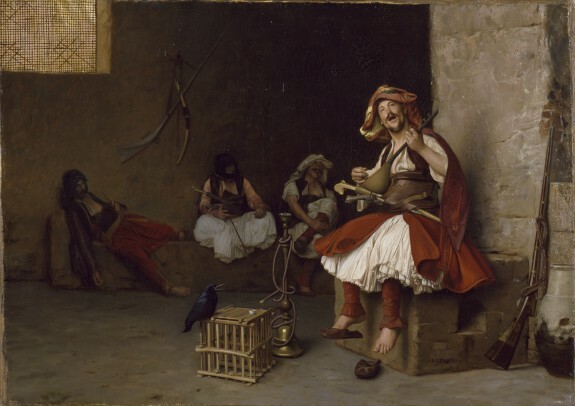 Description An Albanian soldier, called an Arnaut, is seated beside his hookah (water pipe), playing an oud (a lute-like instrument) accompanied by the cawing of a pet raven perched on its cage. Seated in the background are three Bashi-Bazouks, or members of the Ottoman Empire's irregular troops, who were noted for their ferocity. Gérôme visited Greece and Turkey in 1854, sailed up the Nile River in 1857, and returned to the Near East on a number of occasions. Much of his work was devoted to orientalist paintings, which he imbued with a sense of reality by providing a wealth of details. The Orientalists. The Walters Art Gallery, Baltimore. 1987-1988. Gérôme and His Circle: Travel, Art, and Business in the Middle East. The Walters Art Museum, Baltimore. 2015-2016. Provenance Goupil et Cie., Paris; James B. Haggin et al. Sale, New York, 1917, no. 40 [R. H. Lorenz as agent]; purchased by Henry Walters, Baltimore, 1917; by bequest to Walters Art Museum, 1931.